The Sag Harbor Manufactured Gas Plant operated from 1859 to 1930 and originally produced gas from coal or wood rosin. It was switched to a water gas process in 1892. 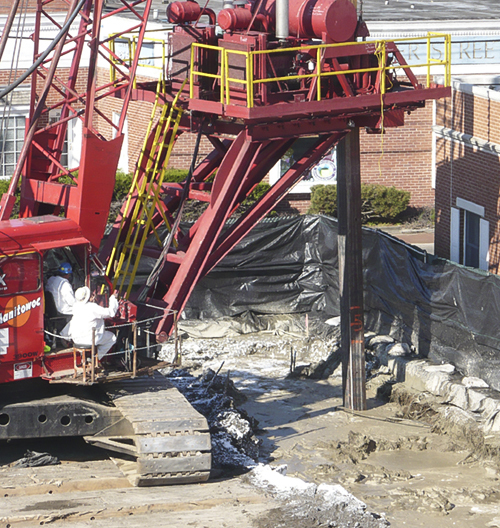 The by-products of gas production that may have either spilled, leaked, or were intentionally disposed of on the site are responsible for the contamination of the site’s sand and marine sediment lithology. The New York State Department of Environmental Conservation (NYSDEC) and the New York State Department of Health (NYSDOH) announced their decision for a remedy and it was signed on March 31, 2006. The chemicals of concern at this site are residues of the former MGP process and include volatile organic compounds, semi-volatile compounds, and cyanide. The volatile organic compounds of concern are benzene, toluene, ethylbenzene, and xylene. Together they are known as BTEX. The semi-volatile organics of concern are polycyclic aromatic hydrocarbons (PAHs). The principle waste material at this site is coal tar, a thick, black, oily liquid which was a byproduct of the gas production process. 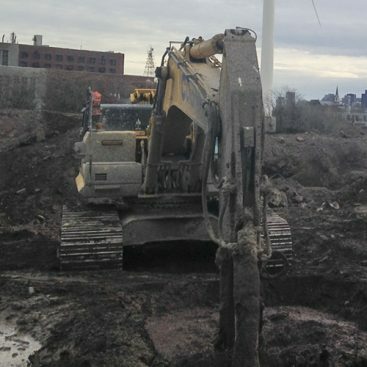 Coal tar has been found under most of the site and mostly located in the upper twelve feet. The groundwater is contaminated by contact with the coal tar and moves to the north, almost as far as Sag Harbor Cove. Geo-Solutions installed over 7,200 Cubic Yards of vertical barrier wall around the perimeter of the site using the Large Diameter Auger Shallow Soil Mixing (SSM) method. The purpose of the wall was to provide structural support and groundwater barrier during excavation of the impacted soil. 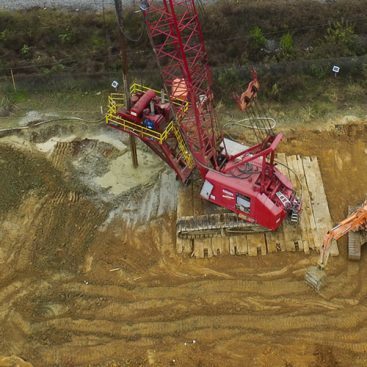 Soil was mixed in place using Geo-Solutions’ custom made Calweld Drill Platform mounted on a Manitowoc 3900 crawler crane. Soil was mixed with Type 1 Portland Cement/water slurry. Slurry was produced in Geo-Solutions’ batch plant. A combination of 7, 8, and 10-foot augers were used to complete the SMW to depths up to 23 feet deep. Due to the nature of MGP waste and this particular site’s location (in the heart of the Village of Sag Harbor), Sevenson / Geo-Solutions faced a unique set of challenges in the completion of the project. The site was immediately adjacent to many active businesses and occupied residences. Health and Safety, odor, and noise control were paramount throughout the project. 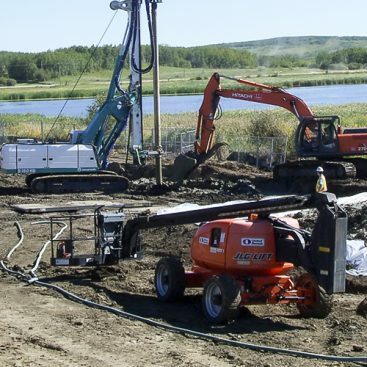 Odor control foaming was used continuously to control MGP odors during pre-trenching and SMW installation, a series of structures equipped with vapor collection systems were used during excavation. Perimeter real-time air monitoring was performed throughout the duration of the project. The small size and geographical location of the site provided logistical challenges as well. Careful coordination was necessary to carry out day-to-day construction activities. Specific trucking routes were established and strictly enforced for all deliveries and trucks hauling waste for disposal. The project was completed within budget and ahead of schedule and with no health and safety related incidents.